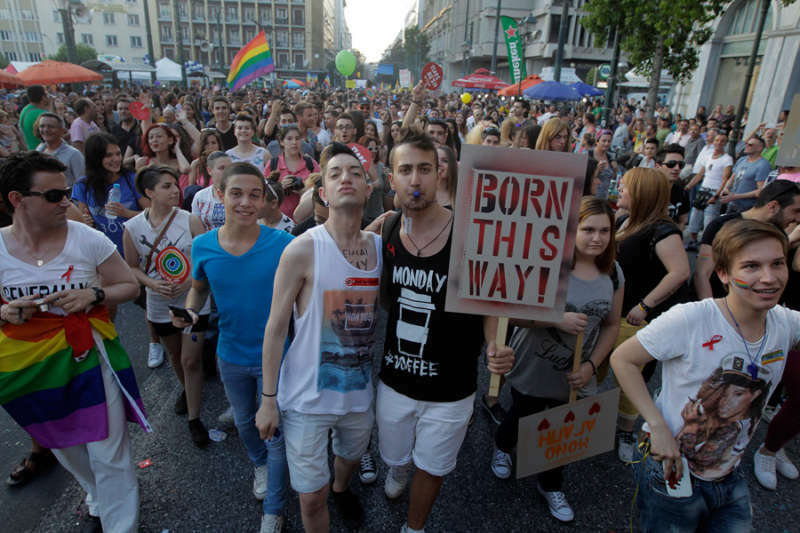 This story about gay Athens was contributed by a Hornet user through our Community Platform. 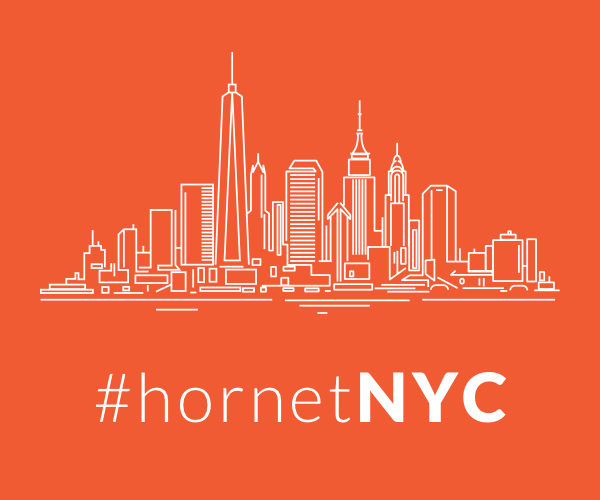 You, too, can contribute stories to Hornet. Head here for more info on writing for us. Athens is one of the oldest cities on Earth, with an epic history that covers the dawn of Western civilization and democracy. Modern-day gay Athens is a must-visit for anyone who appreciates classical civilization, ancient history and, of course, those gorgeous Greek men. And we’re not talking about the marble statues — we mean the very handsome, very real fellas in the streets, bars and clubs. Athens has a lovely Mediterranean climate with hot summers and mild winters. It’s probably best to visit in spring or autumn, so it’s not quite so hot. While as a whole, Greece is still a bit conservative, but Athens (and the island of Mykonos) lead the way in terms of LGBTQ visibility. While English is widely-spoken, you might still struggle with taxi drivers if you’re not clear about your address. Write it down or take a photocopy with you, in case your phone dies and you get stuck. And remember — the Greek alphabet is different to the English one. There’s plenty to see and do here — but let’s start from the beginning. These sites have attracted crowds for millennia. After all, Athens was one of the centers of the ancient world for thousands of years. Lots of the temples and monuments are still standing, so it’s easy to find something that inspires you. However much time you have to spend in Athens — even if it’s just a couple of hours — you’ve got to see the Acropolis. The views of the city are spectacular and the ruins of the Parthenon are awe-inspiring up close. If you can, head up here early in the morning or late in the afternoon, before or after the crowds. If you’re confused, the Acropolis is the top of the hill (the land), and the Parthenon is the white marble building — a temple to the Goddess Athena — that sits in prime position of the hill. 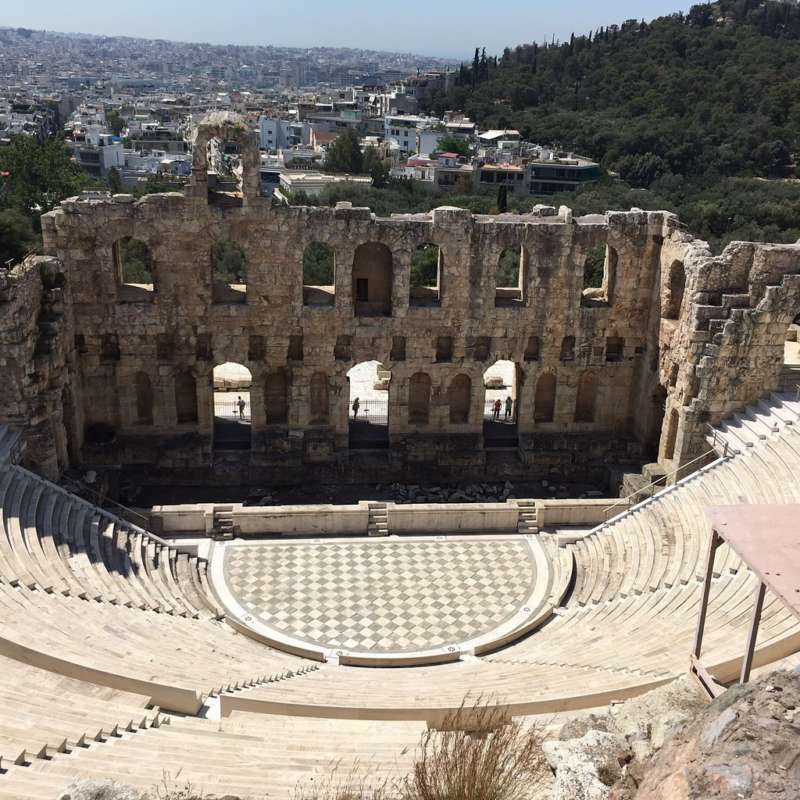 Part of the Acropolis complex, the Herod Atticus Odeon is a stunning open air theater carved into the hillside. If you’re lucky enough to be in the city when there’s a special event or film screening, get tickets! 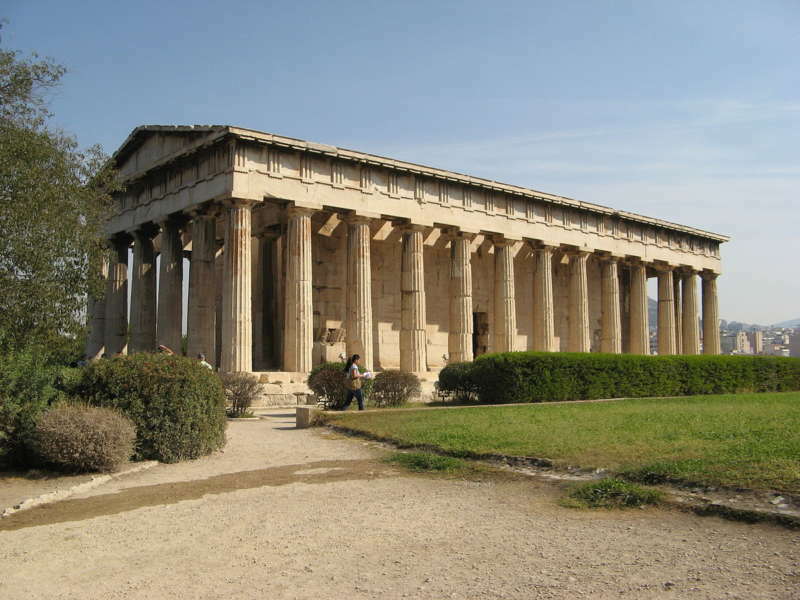 One of the most beautifully preserved ancient temples of Classical Greece is right here in the center of Athens! Grab a book or a guide and take in this wonderful piece of history. The recently renovated Acropolis Museum houses many ancient, priceless artifacts and statues from the surrounding city, and lots more from this unparalleled era of history. The groundbreaking design of the museum itself is stunning, guiding you seamlessly through the exhibits. 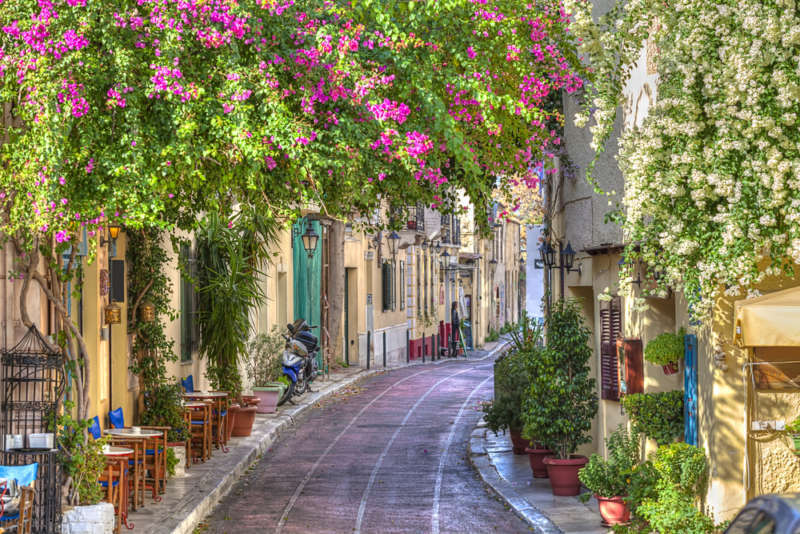 The Plaka neighborhood of Athens, in the shadows of the Acropolis, is one of the oldest parts of Athens. It has the look and feel of many of the Greek Islands, with its winding cobbled streets and quaint shops, bars and eateries. There’s a vibrant atmosphere with street sellers and performers throughout the year. We recommend getting some delicious fresh octopus from the humble Paradosiako cafe on the corner of Voulis and Nikodimou street. There’s a new, modern cultural hub in this ancient city. 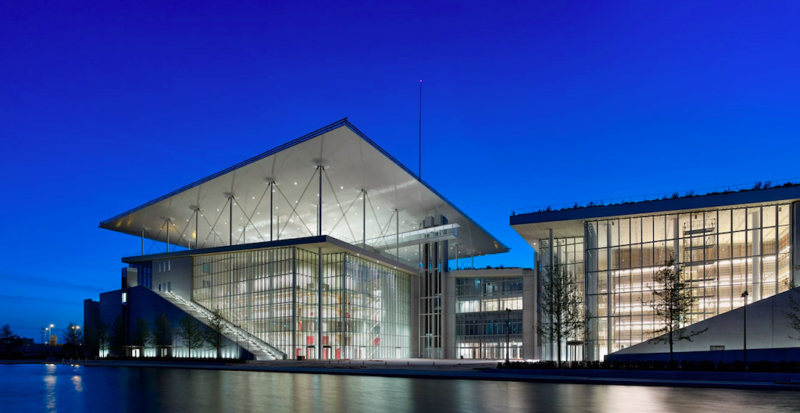 The Stavros Niarchos Foundation Cultural Center (just call it “Niarchos” if you’re tongue-tied) is near the waterfront, and is now home to the Greek National Opera and the National Library of Greece, as well as modern parks and pools. It’s super fancy and well worth a look. If you’re a fan of seafood, try a few plates at Butcher & Sardelles. The garden in the back is really lovely, with a cute, helpful staff. The whole place has a relaxed, gay-friendly vibe, making it a great date spot. For drinks, Cafe Del Sol is worth a visit. 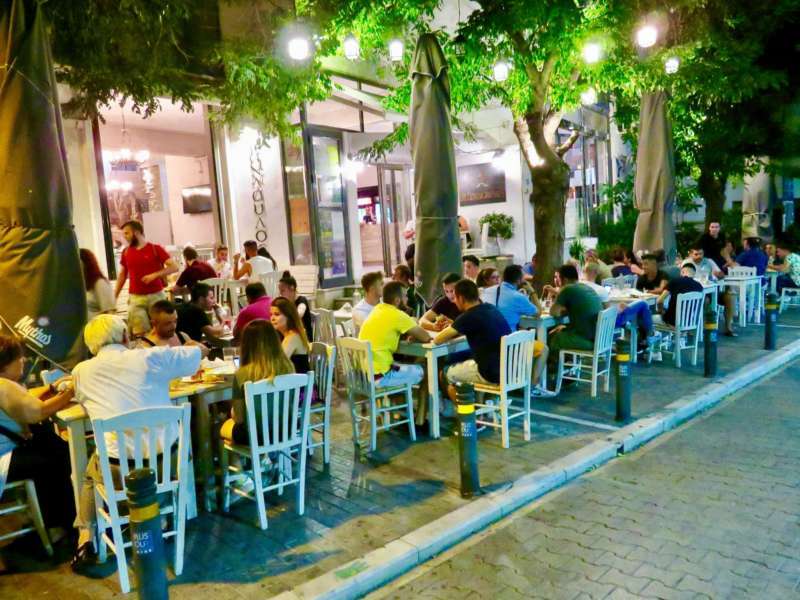 The fun, mixed crowd of locals and tourists makes it a good place to start any night out in Athens, even if you’re well-fed and watered. Just head to Gazi and take in the atmosphere after dark. 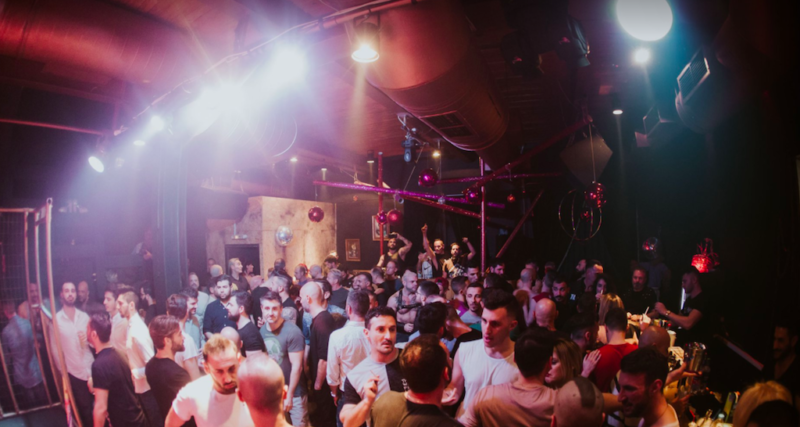 Most of the gay bars and clubs in Athens are within walking distance of the Kerameikos metro station in Gazi. If you like your Greeks bearish, the relatively new BIG Bar will give you all you need. It’s the first of its kind in Athens. 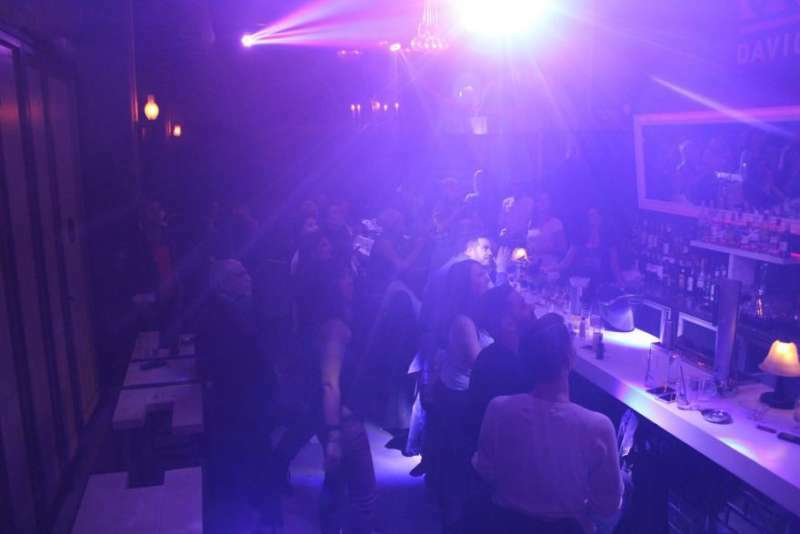 DAVID Bar is swishy and swanky with chandeliers, champagne and is the most decadent night out you can have in gay Athens. Rooster, in the neighboring Monastiraki district, is the best place to meet your new gay friends for an al-fresco lunch or dinner, with great food, coffee and cocktails. This place is the perfect hangout, day or night! The Apartment has the sexiest crowds, international DJs and a floorspace that’s the perfect size. We’ve still got a crush on the guy who runs the place… and if you see him, you’ll understand why. Sodade2 is still our favorite after many years and many visits, thanks to the gorgeous staff, small-yet-fun dance floor and delicious cocktails. Pop music plays throughout the week, with EDM on the weekend and Greek music on Mondays. Shamone is another great nightclub that will take you back to how partying used to be before gentrification and licensing laws screwed over many gay clubs. The high ceilings and crowded dance floor will whip you up into a nocturnal frenzy! Athens Pride is a lot of fun, although it’s unfortunately outshone by the neighboring Tel Aviv Pride, which happens on the same weekend. While there have been calls to move the date and attract an international crowd, but, alas, politics. But if you fancy a more grassroots Pride with plenty of local talent and plenty of good old-fashioned Greek drama, maybe opt for Athens instead. Outview is one of the biggest queer film festivals in Europe. It takes place every April, with premieres, screenings, awards, workshops and classes. What’s your favorite place in gay Athens? Let us know in the comments!